Founded in 1939, Zeffirino has accumulated plenty of tourist and celebrity cred over the decades ( “Ambassador of Italian Cuisine” and so on). 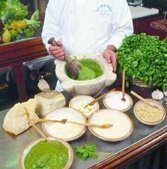 Kudos to owner Zeffirino Belloni for his tireless efforts in the service of pesto, which he helped popularize, but his place, while absolutely gracious, suffers from some of the over-exposure plague that has afflicted Alfredo in Rome. Yes, Frank Sinatra and Luciano Pavarotti came here, but those days are over (or maybe just moved to Las Vegas and Hong Kong, where the restaurant has branches in the The Venetian Resort Hotel Casino and the Regal Hotel, respectively). Yes, the pesto is still a welcome staple. But the Italo-French menu is static, the sense of the inventive minimal, with laurels rested on. That said, it still makes for an expensive if honest evening of good seafood, fine desserts, and an ample wine list.